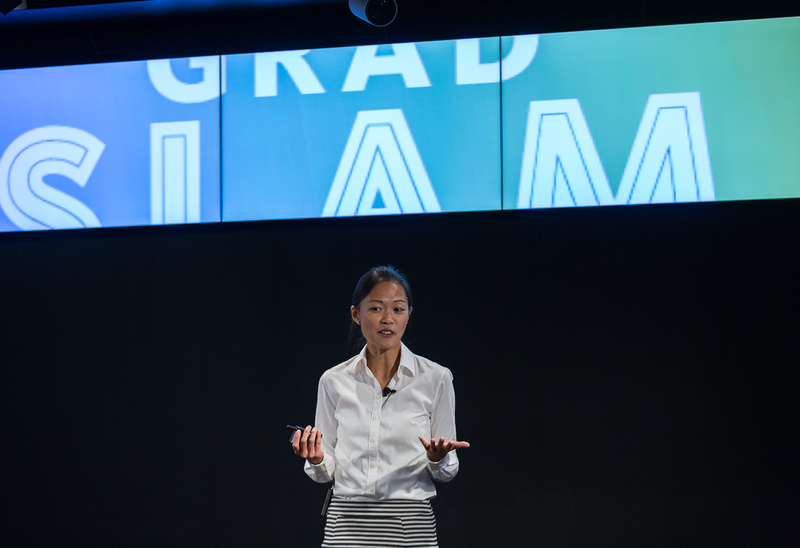 As the winner of UC Santa Barbara's 2016 Grad Slam, Nicole Leung's talk on "Lighting the path from the eye to the brain" vaunted her to the systemwide finals. Graduate thesis topics are not generally known for brevity. But over the next three months, hundreds of UC master's and Ph.D. students will compete to break down their research into bite-sized portions for UC Grad Slam, a systemwide contest for communicating research. Now in its third year, the contest challenges students to present their research in three jargon-free minutes. Contests will be held on each of UC’s 10 campuses over the next several weeks, starting Friday, Feb. 24 at UC Santa Cruz. Participants vie for prize money and the chance to claim campus glory, grad student style, by taking home the systemwide trophy, known as the Slammy. The 10 first-place campus winners compete May 4 at LinkedIn’s headquarters in San Francisco. The fast-paced, lively competition, which is live-streamed on UC’s Grad Slam website, is emceed by UC President Janet Napolitano and judged by a panel of leaders from government, industry, media and higher education. The aim is not to dumb down research, but to give emerging scientists and scholars the skills to communicate their work — and its impact — to a wider audience. Participants spend weeks and even months preparing: taking communications and public speaking workshops — in some cases even training with theater troupes — to hone their pitch. The result is an entertaining and informative series of events that offer the public a window into the world of academic research. UC’s 33,000 academic graduate students represent a massive, and sometimes overlooked, brain trust for California. They spend their days unearthing new knowledge to help feed a growing population, preserve the planet, explore the stars, raise resilient children and find cures for diseases such as cancer and Alzheimer’s. UC grad students also represent a major asset to a California workforce increasingly in need of multidimensional thinkers who can understand complex issues and engage in creative problem solving. To connect this high-powered talent to government and industry, however, emerging scientists and scholars need to be able to explain their life’s work in a way that resonates with regular mortals. “It’s become clear that, beyond the deep training they get in research and scholarship, we also need to help our students become effective ambassadors for their research,” said Pamela Jennings, director of Graduate Studies at the UC Office of the President, which spearheads the systemwide competition. Participants say the contest helps them hone in on the main points and objectives of their research in a way that makes them better able to secure grants, land nonacademic jobs, and explain the value of their research to people outside their field of expertise. Best of all, say some students, they have a chance to step back from the day-to-day details of their work and consider its impact in a larger context.